On Sunday, April 26, 2015, Colby College will host Maine Migrations, Past and Present. The conference will bring together folks who study, work with, care about, or are themselves members of minority communities that immigrated to Maine, both recently and many generations ago. 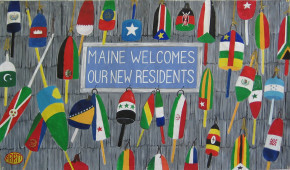 We will explore common dynamics across diverse immigrant communities as well as the similarities and differences among their experiences in Maine. The conference is open to all at no charge; registration is required for the (free) dinner and keynote address, as space is limited. The Maine Migrant Health Program will be part of a panel discussion. Please join us as Ben Hummel, our Camp Health Aide Program Coordinator, speaks on the topic “Making a Living as a New Mainer.” To check out the full details of the conference, please visit Colby’s website.